For Naik now, the Larsen & Toubro Employees Trust with its 12.3 per cent stake and another 6-7 per cent in the hands of employees via stock options will act as a barrier to the possibility of a takeover. “Such a thing will not happen now because we have a near 20 per cent stake,” says Naik. Naik created L&T as we know it. Today’s transformative conglomerate did not look the same 18 years ago when Naik first stepped into the shoes of CEO and managing director. Nearly 85 per cent of the business revenues of L&T come from the many new business verticals, which swelled sizeably under Naik. Now, the company’s biggest strength is its differentiated verticals that bring in more than Rs 1.2 lakh crore in revenue from 81 segments, with about Rs 35,000 crore coming from overseas businesses. But Naik’s creation is far from complete. While the man will pass on the reins of L&T’s mammoth operations to Subrahmanyan (57), there are a few functions that Naik will personally oversee, such as providing leadership to some existing projects, pruning the roster of businesses down to a few core ones, and ‘mentoring’ the next batch of 22 persons handpicked to become the next group of leaders L&T will need in 2030. Across the globe there are not many CEOs who are looking to groom the next level of leaders like Naik is engaged in. Indian corporates – both family run and professionally held businesses – across sectors are seeing a churn in leadership. Naik is probably the only non-family-run business who has expanded into different business streams. And like Warren Buffett who considers work place to be a temple, Naik too enjoys and grows everything he does. Naik is a constant thinker and go-getter. 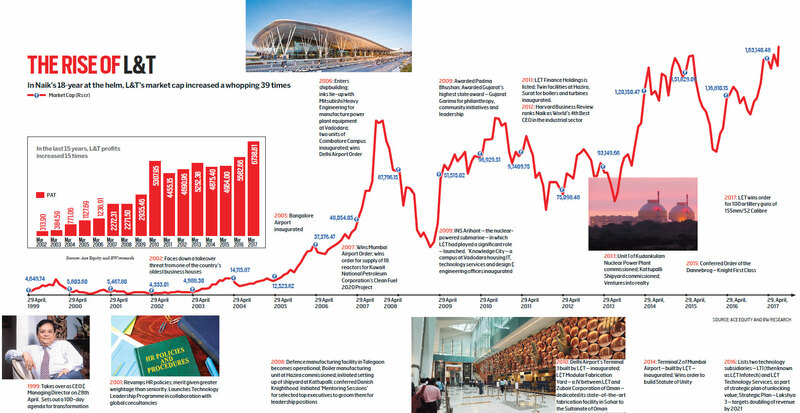 Post 2009-10 when construction and industrial business slowed down domestically, Naik immediately set up offices in international markets, particularly the Middle East, to ease business pressures. He is flexible unlike other CEOs who say no to everything. Naik is known to be a risk-taker, and would rather explore new ventures, which explains new business activities such as defence, power equipment and real estate. One could even probably draw comparisons to Jack Welch, who did not shy away from taking strategic business risks. Now, of course, Larsen & Toubro is in the midst of a restructuring. It is reducing its balance sheet of some low-margin businesses. 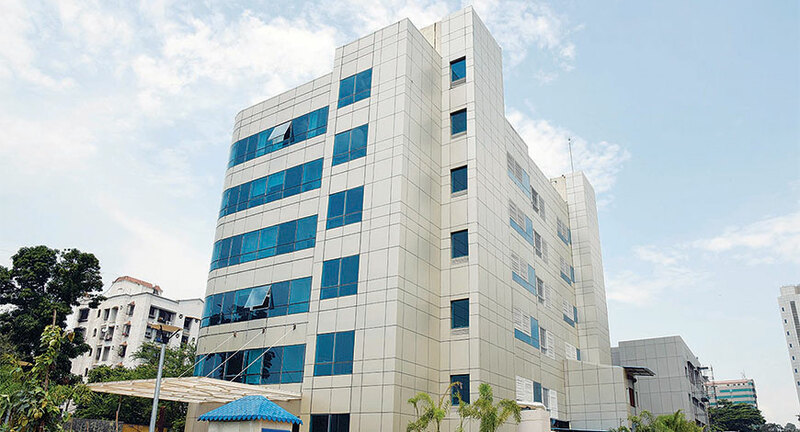 Back in 2013-14, the organisation was faced with tightening business conditions in the domestic market and had to look overseas for business. L&T shifted the direction of the company from pursuing a heavy asset business model to a lighter and nimbler one. Naik is not sticky about his businesses, and if he feels that a particular business is not worth pursuing, he would rather sell it. Naik, of course, sold the cement division way back, and the foundry and some other businesses lately. L&T is now looking at cutting back 5-6 such low profitable, capital-heavy businesses. Naik is known for meticulous planning. 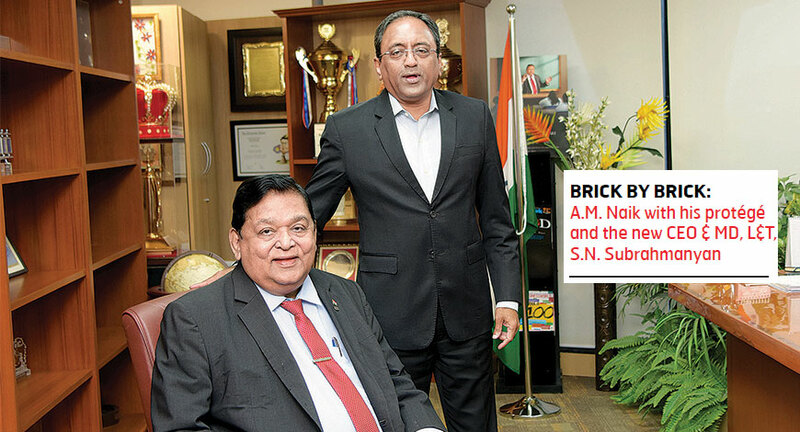 He started a succession plan in 2006 after having spotted Subrahmanyan doing some outstanding work in the construction division based in Chennai. 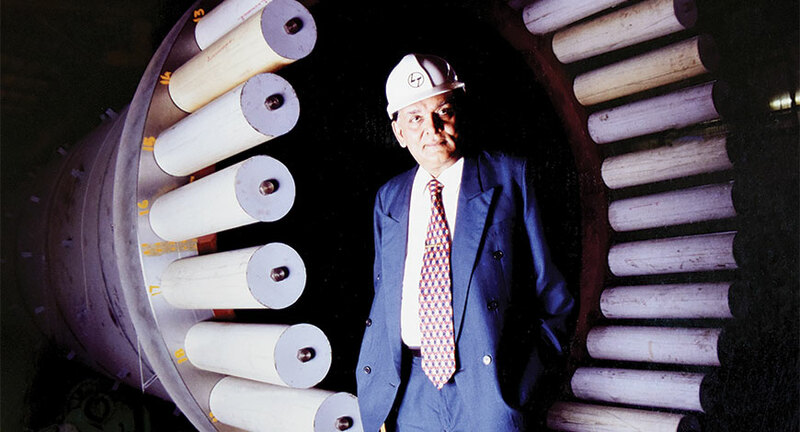 Over the years, Naik handed over various projects and units to Subrahmanyan including some of the important divisions such as the hydrocarbons business. Naik views succession planning as the most important part of a professionally run business. 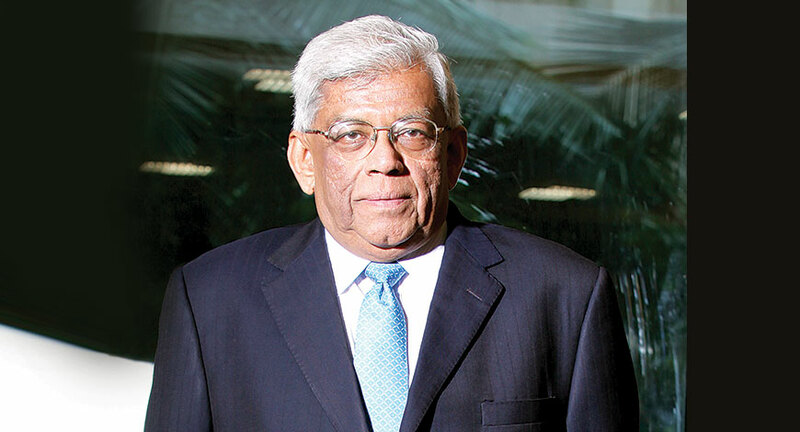 “Succession planning in a promoter company is very different from a professional company,” avers Naik. The chairman has chalked out a plan for succession planning till 2030, listing the top people who will retire and grooming worthy successors to take on those roles in future. “My time will be mentoring and succession planning so that the company is strong till 2040, and defends itself,” says Naik. What is important is that he has built a non-cyclical business in a cyclical market by way of constantly looking out for opportunities, and striking out well before others. Naik’s leadership wisdom stems from delegating and expecting nothing less than the best from his team members. If you cannot delegate, you cannot build such a large organisation. From the beginning he has delegated responsibility and allocated businesses to its CEOs and leaders, and decentralized decision making. You see some more of his business wisdom where he does not fear failure. He would rather do something and fail rather than fail to do nothing. You could say he has the uncanny quality of business and finance brain like Buffett. For example, when the entire engineering and infra space was under stress, he was able to manage its finances with little pressure on balance sheet which only comes with the financial acumen of the CEO who can think in the same manner as that of a CFO. L&T never crossed debt limits over a certain limit. Naik is not a helicopter CEO. He doesn’t hover around, but he will talk about his ideas loudly, and make sure that his strategies are implemented even if they fail to achieve the desired results. Naik places great importance on people and retaining talent in the organisation. In fact, it was in 1999 that Naik started an “infotech” division to reverse the brain-drain that L&T was plagued with. Many smart engineers at the conglomerate were moving to mushrooming IT companies because of higher pay, and because companies were ‘poaching’ experienced talent from the engineering behemoth. Naik made it his mission to keep talented young IT engineers within the conglomerate and formed a new company, L&T Infotech, offering better salaries. He also instituted a stock option program to retain top talent, simultaneously adopting in the first plan a 3P model (for People, Performance, Position). The model identifies and rewards the right person for the right job. 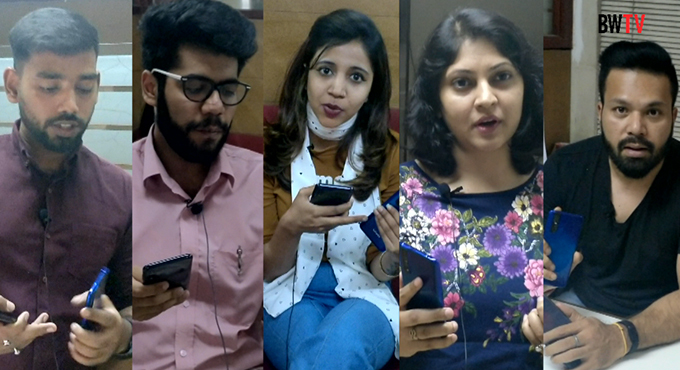 “The huge emphasis that he placed on HR, talent recruitment and training has brought about a vast cultural change in the organisation,” says Subrahmanyan. At that time, the rationale was that if L&T were to move up the value chain, it had to take up highly complex, strategic businesses. The Boston Consulting Group was assigned to develop the first five-year plan, called ‘Project Bluechip’, as the target was to become one of the most sought-after stocks on the bourses. Over the years, L&T has conceived and executed four such five-year plans, which from the second year onwards began to be called Lakshya, an acronym that stood for Lean, Agile, Knowledge, Speed and Scale, Humane, Yielding value, Action-oriented. A giant business such as L&T needed strategic thinking. Between 2005 and 2010, in the second plan, Naik implemented a rigorous programme-management plan. It involved a two-pronged strategy of reducing costs and improving operational excellence. During this time, L&T also looked at various new sectors such as ship-building, forgings shop, power, and water as new growth segments. Its latest five-year plan aims at revenue of over Rs 2 lakh crore by 2021, with new growth areas such as defence, water, “smart”-world, IT and technology. Capital for these has already been allocated, and now the company will be looking at deriving more value from these assets created painstakingly over the years. Fresh out of engineering college in the 1960s, Naik had a ‘dream’ to work for L&T, which was one of the few national companies then. Given that he came from Gujarat and was new to Bombay, Naik initially worked in a smaller company, Nestor and Boiler, before gaining valuable experience for entry into L&T as a trainee. Such was his yearning to work for the company that he even took the job at a lower salary. Within 13 months, Naik overtook all the trainees, building a strong work ethos even then, and putting in 16 hours a day on the job. For the first 21 years, he did not avail of any leave, and would often work late into the night on the shop floor. “L&T is the only platform I can use to serve the nation. Basically it is serving the nation. I worked very hard and delivered results,” says Naik. He executed project after project, and soon rose to the top management, where for the first time he thought that one day he would run L&T. In 1999, he became the CEO and managing director and, in 2003, was appointed chairman. One of the many characteristics of Naik over the years has been that he thinks way ahead of anybody. Most of his colleagues have to prepare themselves thoroughly before they meet him. 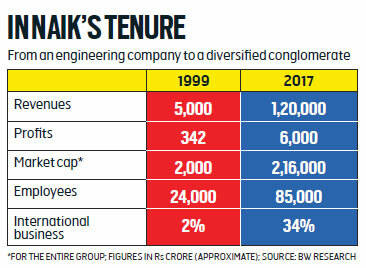 Naik’s team also considers that the success of L&T as a group is due to the fact that the man has sheer passion for engineering and a gene for perfection. Naik sees execution as the biggest challenge. “Everybody has ideas, but it is execution that is most important,” he says. Naik says that ship-building was 10 years ahead of its time. But now, defence will be divided into four segments: weapons, submarines, navy, guns and defence electronics. “We are not getting into aircraft. We have the potential to be a Rs 2 lakh crore company in the next 10 years. If we win about Rs 5,000 crore a year, we will do well,” believes Naik. Naik is a strategic thinker, who is also looking for organic and inorganic ways to create opportunities. 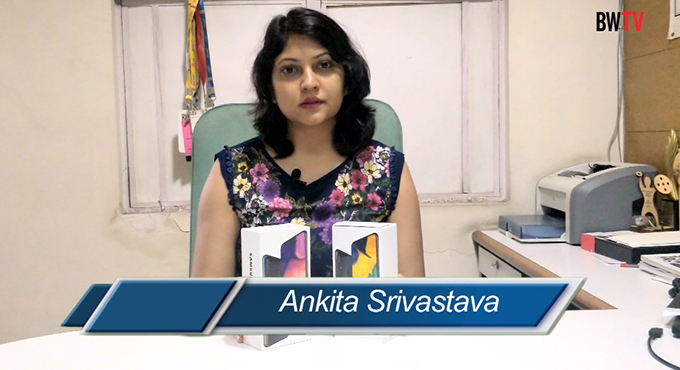 L&T has picked up stakes in companies such as Astral Microwave, where there is a synergistic business. Naik has also built a cash trove of Rs 6,000 crore to acquire companies in new areas, if they so happen. Naik considers that he can buy companies with an outlay of Rs 10,000 crore easily through leverage. He believes that through construction and engineering he can build India, but at the same time it has to be done through profitable growth. Many of the old engineering companies that were competitors of L&T have faded away because they did not take profitable projects. “I refused to bid many jobs because it won’t make money,” says Naik. But even as Naik handed over the sword, more like a baton, he is not retiring. He will still devote much time to L&T and its group companies. For instance, in October, he will travel to the US to seek more business for group companies in technology, although many of his executive functions will be considerably reduced. He will also devote much time to his personal and company trusts, and plans to keep himself considerably busy with charity.